Sharla Jolly pictured with members of the Kaskasia River District UMW. Cunningham Children's Home became a mission and ministry of the United Methodist Women (UMW) when Judge Joseph and Mary Cunningham deeded their home to the women of the Methodist Episcopal Church, now UMW, in 1895. The Cunningham's felt confident that the UMW would sustain great care for the needs of the children. Today, as a mission and ministry of the United Methodist Women of the Illinois Great Rivers Conference, we rely on their loyal support. In addition, United Methodist churches and individuals play a key role in providing the basics that help our kids heal, learn, and grow. Over the years, many things have changed, but our vision - to see every child thrive - has remained constant because of their leadership. We salute their loyal support, then, now, and always. Please prayerfully consider whether or not God is calling you to join us as we provide hope and a future for our most vulnerable youth. Our rich, historical connection with the United Methodist Women tells the story of the hundreds of amazing women who have served alongside our staff and prayed for our kids for the last 124 years. 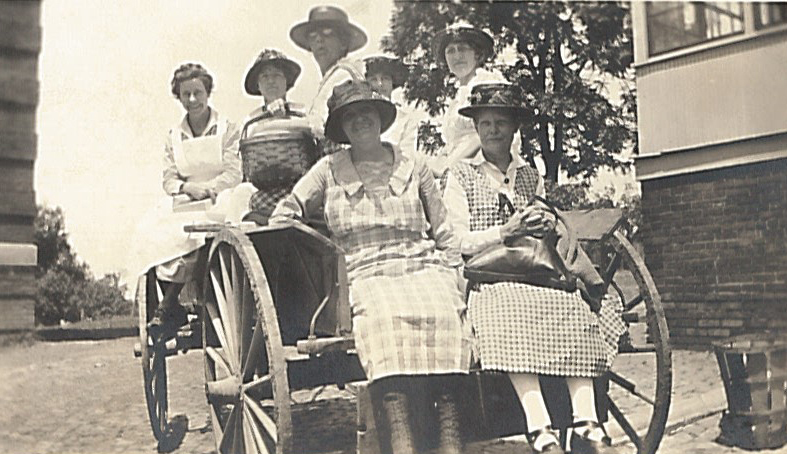 In this photo, taken in the 1920's, the faithful United Methodist Women (UMW) are delivering canned goods for our youth. We've heard stories from the adult children of UMW who remember their moms canning for their family then dividing the amount in half to make sure the kids at Cunningham had plenty to eat. That's generosity. And a wonderful example of the relationship we've shared with UMW. You see, in the 1940's, the UMW petitioned the federal government for a much needed building, but it was war time and everything was rationed. For them, it didn't matter. They knew the need and they were going to take care of the children at Cunningham. And they did! Our past is full of groundbreakings and new construction...and our future is too! Cunningham building a much-needed school and gym with the Education and Recreation Center (ERC). We broke ground on the ERC in August 2017 and construction is well underway. The UMW are working alongside us in order to give our students greater academic success by providing a learning environment that meets theirbehavioral and special education needs. We anticipate a move-in date of December 2018. We have a deep appreciation for the prayers, love, and giving spirits of UMW. Although we no longer accept canned goods for our youth to eat, the women generously provide modern day gifts. We call them Hope Gifts and they come in the form of socks, underwear, body wash, deodorant, gift cards, and so much more. These women also work tirelessly on our behalf, volunteering at events, serving on our Boards and committees, making quilts for our kids, and sharing our stories with friends and family. On March 23, 2019, United Methodist Women (UMW) marked 150 years of women in mission with services to and advocacy for underserved women, children and youth. The UMW will celebrate its strong foundation and prepare for the next 150 years so that their daughters, granddaughters, nieces, and sisters in Christ can continue their legacy of faith, hope and love in action. We celebrate all you have done and will continue to do through your faith, love, and action. May God bless you immensely!